The political game has just begun for Priyanka Gandhi. Will she go on to clinch the title or lose the plot? Brand Priyanka Gandhi is Charming say a whopping 85% respondents in a 720 respondents on-line straw-poll pan India over the 26-27 January, 2019 weekend, conducted by the Mumbai-based Indian Institute of Human Brands (IIHB). She is Pedigreed (78%) and Stylish (75%). She has high scores on Pleasing (68%), Intelligent (61%), Friendly (66%) and Confident (66%). She is seen to be Empathetic (61%). She is not Arrogant (69%). But yes, she is a bit Aloof (48%). The brand-map of the Gandhi scion would surely do a Bollywood superstar proud. The interesting part of Brand Priyanka is that her scores across both men and women follow an almost similar pattern. Women, of course, find her extremely stylish, voting almost 90% for the youngest Gandhi. On pedigreed too her scores amongst women are almost 90%. Men don’t find her arrogant; though women there have a bit of a split verdict. More men find her intelligent, and friendly, than women do. But yes, more women far outnumber men in labeling her aloof. If any, that is the only serious downer for Ms. Priyanka Gandhi-Vadra. Overall, she comes across as a highly charming, well-liked, well-loved brand. More than the human factors in her personality, it is the future leader in her that demands attention. 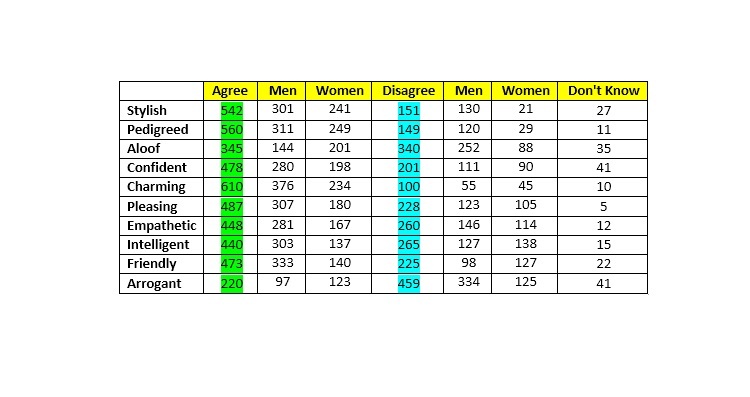 The table below shows that respondents see her as a tough, inspirational and good leader, with a pleasing personality. Inexperience does not seem to be seen to be a negative. The vote on being a late starter is kind of evenly divided. The same holds for impact in the future: a split vote. Actually the high ‘don’t know’ in the rating for ‘tough’ too maybe an indicator of how respondents are not entirely sure on how she will or will not blossom into a leader of stature. Priyanka’s better-half is a drag. But her seeming similarity to grandma Indira Gandhi and the halo of the 100-years and five-generations old Brand Gandhi gives her tremendous strength, though the research negates her dependence on the famous family name. Brand Priyanka derives maximal strength from her grandma. That is perhaps the lead factor in her overall appeal. Despite the passage of thirty five years, the legend of Brand Indira Gandhi is still very much alive, inspirational and worth emulating in a large part of India. As a spitting image of one of the most famous Prime Ministers in Indian history, Priyanka carries with her a legacy, a great legacy. And yes, she is seen to complement brother Rahul. Brand Priyanka is surely going to be a shot in the arm for the Congress. She is seen to be honest, no-nonsense, trustworthy and a tough competitor. Very high scores on all. Positivity towards Brand Priyanka is high not just because she is a Gandhi, but because she will be bold, aggressive and positive … just what India needs. I have been researching Human Brands for well over 20 years now. I have never seen a ground swell quite so positive for any celebrity … Bollywood star or cricketer … over the years. In 2004-5, I flirted with researching political and corporate leaders as part of the Dentsu Celesta study. No one in that list also came remotely close to the goodwill Priyanka seems to enjoy across the spectrum as of now. Mine is not a political analysis; it is just an academic study on figuring out where Priyanka, the brand, stands as of today. Well, on a purely academic basis the verdict is an A+. Without an iota of doubt. Whether that converts into votes is not my domain. I will sign off by saying that Brand Priyanka today is a love-all brand, poised for a great take-off. Inshallah!